In avoiding housework and Google-work for the moment I was catching up on several blogs. I came across these links, and now I sense a food-in-a-jar might be attempted this weekend or early next week…. It’s a way to use my mason jars out of season! I’ll have to find where Lorelai has taken the lids to though – she uses them as bracelets. Pie-in-a-jar from Little Birdie Secrets, which may have started it all. Cake in a jar from Angry Chicken. Not Martha’s Pies in Tiny Jars tips. But first, I will be attempting granola bars (a la Martha Stewart & my Baker’s Edge pan). This is one of Jackson’s best tricks – we call it “The Squirrel” because how he sits upright with his itty bitty paws. 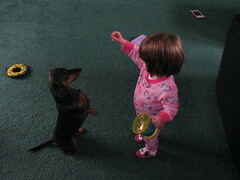 Lorelai frequently walks about carrying her little snack cup (by Munchkin, more on them later). 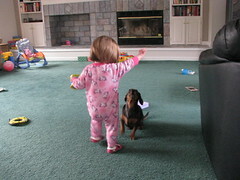 She has learned that if she holds something in her hand out and up infront of Jackson he’ll sit up and try to get it. Goldfish, cheese, bits of eggos, whatever. This picture shows that my kids are about the same “height”. Jackson is very gentle in getting the food from Lorelai. Sometimes she lets go, sometimes he gets to sniff the food and then she takes it back (and I ignore the dog slobber on her snacks). The bigger issue now is that I want her to actually give the snack or whatever to Jackson – if he sits and behaves he has earned the treat. She’ll even hold her empty hand out and up to get jackson to sit (sometimes he pays attention and doesn’t bother if he knows she doesn’t have anything). 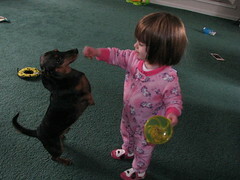 We working on (and will be for a long time I am certain) not teasing the dog. He’s a good sport. Like always. I think I have enough left over for a second one – and I also think that it will take me longer to sew on buttons than it did to actually knit it! Back to Munchkin for a moment. 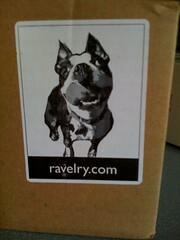 They are my new favorite company. The snack cup is fantastic (way better than the gerber one, don’t waste your money.) Recently I bought one of their flip straw cups – it just makes life easier to get Lorelai to use straws (and she does just fine with them). The colors are great, and the cups are BPA-free (important). Well, I wanted to buy more of these – like a 2 pack I see of all the other brands, but couldn’t find them – not at Target / online / wherever. So I was hunting around online for something else that might be suitable and everything it seems is covered with Dora or Diego, the Disney Princesses, Sesame Street, Elmo or SpongeBob. Now. I have nothing truly against any of these brands, I really don’t. I am not going to keep any of those things from the Lorax intentionally, but right now – all she needs is the cup with the straw. She doesn’t care right now if it’s blue or pink or yellow with purple polka dots. Then I came across the dwink juice box holder and I got really annoyed. What’s worse – character branded marketing or terrible spelling? I want to write a letter of complaint to that company. I held off settling for any of the character items and was thinking about investing in the more expensive “Green” options and then I found it. A 4 pack – two sports bottle, 2 flip straw cups, all the Munchkin brand and BJ’s wholesale club. Perfect. The cups are all interchangeable. Bright colors. Lorelai picked the blue-green-purple pack, even better. Okay, end of silly rant. A reader left me a comment asking about yarn bobbins – I hope this helps. I inherited the ones I use from a box of random knitting items that my mom gave to me (I think some came from a volunteer group and some from my grandmother). These are the ones I have, but this page has other options. You can also use other items around the house as needed. I have used them when working with two colors (not stripes, but for fair isle? intarsia? whatever it’s called). The main color is still attached to the yarn ball. The accent color is wrapped around the yarn bobbin and you knit from that – it just hangs down in the back of the work and you can use it as needed. It keeps things a little neater. 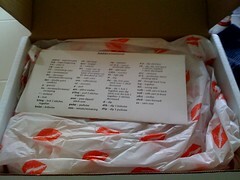 Last week I received several great packages in the mail. 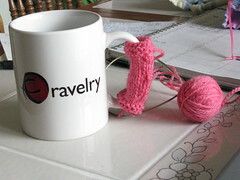 I treated myself to the Ravelry mug. 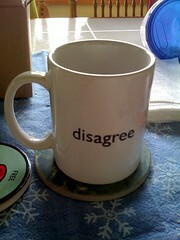 Dan rolled his eyes when he saw it, even after I tried to explain the awesomeness of the “disagree” when it’s empty and “Agree” when it’s full of coffee. I even offered to share the mug with him. 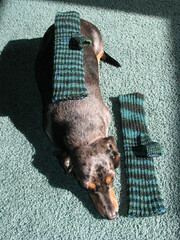 He said this was just more reason to keep on planning my “knittervention” (We’ve been watching “Intervention” lately.) Whatever. I like the mug, just wish it was a little bit larger. (excuse the iphone lo-quality photos) I got a PhatFiber box. 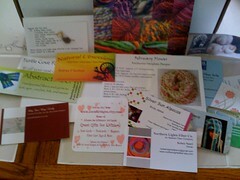 There are fantastic samples – the fudge was fantastic! I pulled out my drop spindle and started playing with some roving I had to get more practice before I try it on some of the fiber samples I received. 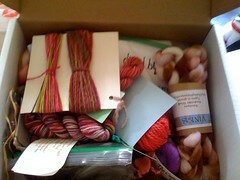 There are also several great yarn samples as well. I’m sure i’ll gush more about those as I get to them. 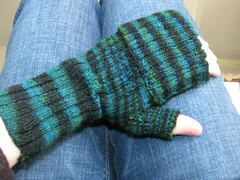 Over the weekend I finally finished my iPhone Mitts. The yarn is “Bekka” from Ruby Sapphire. Love love love. I really like how the stripes start out wide and then become narrower towards the finger tips. I made mine 13″ long, and the thumbs are ~2.5″ – I was getting tired of knitting a big ribbed tube, and I can still fold them over just fine. Jackson makes for a great model. So that’s 220 yards knit up which is 0.125 miles in the Sock Marathon. I still have quite a bit of the yarn left over, so I’m thinking (in terms of convenience) of casting on for a pair of anklets. I think I would have enough for that and it would be sort of “springy” and possibly get me back into sock knitting. But then my mom called. I was planning already on going in to RI tomorrow for a “swap” – a frequent event where my 6 aunts, mom, grandmother, and me get together to “swap” clothes and such. Totally planning to bring the Lorax along. In a snap decision to give my grandmother more 1:1 time with the Lorax and carpool instead of two separate cars going to the same place, Lorelai and I are going in to RI tonight to stay over at my grandmother’s house with my mom. On the plus side, my mom is doing the driving so I get to knit – yes! Anyway, it’s a book I think that started out as an easy gift for everyone in the family. The book has no photos of the food, though there are some illustrations. But it’s a fairly reliable source of recipes. When I was 20 or 21 I specifically asked for a copy of “the book”, and I got it. I took my copy and sat down with my mom’s copy and copied all the notes she had written next to the recipes: VG, looks great – taste’s awful, not worth the effort, delish!, makes a ton…. 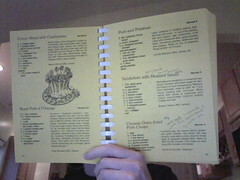 And I have even added a few notes to the book myself as I have gambled on a few of the recipes. 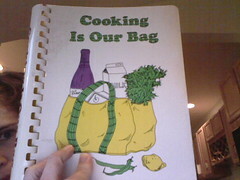 It is not very green or healthy as cookbooks go (one recipe has MSG as an ingredient!) but it’s my go-to, and substitutions can be made. Dinner tonight actually came from “the book”, and I thought I would share. I should share more recipes – I know I have borrowed many from the web! Combine egg, soy sauce, sherry, ginger and garlic powder. Dip chops into egg mixture. Place in single layer in greased baking dish. Bake at 350 degrees for 30 minutes. Turn, bake additional 20 minutes until tender.